Dubai: The gray market for cellphones is set to decline further as consumers are moving to branded phones due to the fall in prices of these devices. Many branded Chinese manufacturers like Lenovo, Huawei, ZTE and TCL have started making smartphones for as low as Dh300. 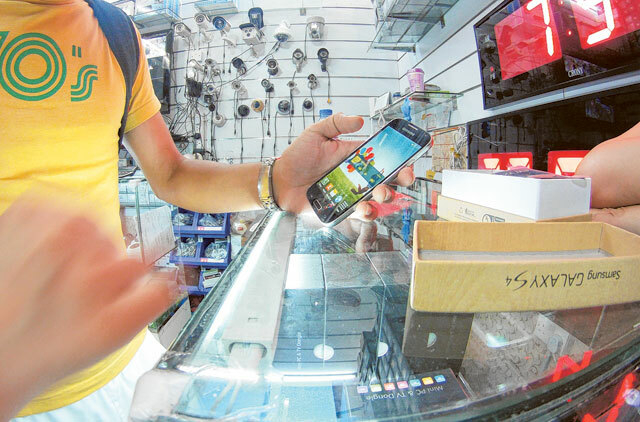 The gray market includes counterfeit smartphones like iPhones, Samsung Galaxy series and BlackBerry devices sold for as low as Dh400. The unbranded Chinese manufactures or white-box manufacturers use smuggled chips, fake International Mobile Equipment Identity (IMEI) codes and lack official certification from China’s Ministry of Industry and Information Technology (MIIT) to sell their devices. The market for gray devices has declined in the UAE as more brands have addressed issues with regards to price deltas that existed earlier and lack of availability of new products. “We’ve seen various instances where the Apple iPhone or Samsung Galaxy S4 is available cheaper through official channels than through gray market operators with the added advantage those official stocks carry a full manufacturer’s warranty. In the case of BlackBerry and Samsung, we’ve seen them launch devices here either before or in tandem with the rest of the world,” said Ashish Panjabi, COO at Jacky’s Electronics. The definition of a smartphone and a feature phone has blurred over the last couple of years. Feature phones have less processing power, lack operating systems and cannot run applications similar to smartphones. A high-end feature phone costs around Dh350. Nokia’s Asha was probably the first to do this as they started enabling many features such as Facebook functionality or chat platforms like WhatsApp into their devices. Nokia would argue that Asha is a smartphone but various competitors would deem the Asha range to be a feature phone. The traditional feature phone of the yesteryear which focused on one core function like sound (Walkman Phone) or photography (Cybershot) is dead and a feature phone today is expected to be a multi-feature phone. The Middle East and Africa is currently ranked second after Asia Pacific as the largest gray market for cellphones, followed by Central and Latin America. The Middle East and Africa surpassed Central and Latin America in 2012. According to the research firm IHS, worldwide shipments will fall by 12 per cent as both makers and buyers of these handsets turn to branded products. Shipments reached their peak in 2011 with a total of 250.4 million gray-market cellphones. But beginning last year, the market began to shrink, contracting to 221.5 million units. The shipments will continue to fall this year to 194.6 million units, followed by another steep fall to 173.8 million units in 2014. “What we’ve seen quite clearly emerge as a trend in most brands is that they’ve had to rely on a suite of smartphones at various price points to penetrate various customer segments. For example, we see Samsung with smartphones priced as low as Dh299 and going up to Dh2,699.,” Panjabi said. Nokia, Lenovo, Huawei, LG and HTC have all tried to plug themselves into these price bands as a result. Apple has been the one standout till date but “we’ve seen them officially re-introduce the iPhone 4 in the UAE market in the last two quarters as they’ve seen they need to be in more than one price band,” Panjabi said. “Makers of gray cellphones are finding it difficult to remain profitable and differentiate their products from other counterfeits. The gray market is not profitable as it used to be due to the yuan appreciation,” said Kevin Wang, director of China research at HIS, in an e-mailed statement.